Workshop of Michel Wauters, after cartoons by Giovanni Francesco Romanelli, Death of Dido, c. 1620–40, wool and silk. The Norton Simon Museum presents Once upon a Tapestry: Woven Tales of Helen and Dido, an exhibition of exquisite tapestries and rare cartoons (full-size preparatory drawings) that illustrate two iconic love stories found in the classical epic poems the Iliad and the Aeneid. Helen and her contested romance with Prince Paris of Troy, as described in Homer’s Iliad, is represented in four sumptuous Flemish tapestries from around 1500; and Queen Dido of Carthage and her passionate affair with Virgil’s hero Aeneas is represented in a rare set of six cartoons, and one related tapestry from the early 17th century. 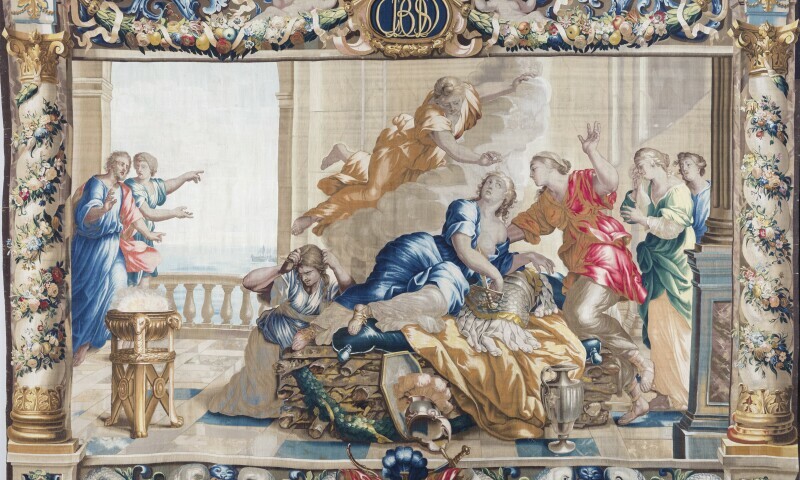 Seen together, these monumental works of art demonstrate the appeal of these female-centric narratives in early modern Europe, the power of tapestry to tell such stories, and the inventiveness and skill employed to produce these splendid objects, made for only the wealthiest and most distinguished patrons.